The Mortgage Process should be STRESS-FREE! Get Started Today to Experience Our 5-Star Difference! Need a Home Loan in Delaware, Maryland, Pennsylvania, New Jersey or Florida? 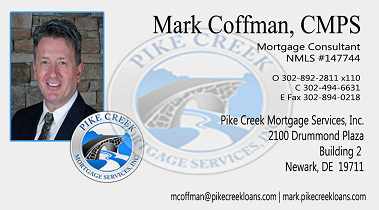 Mark Coffman and Pike Creek Mortgage Services, Inc provides homebuyers with a quality home loan throughout Pike Creek, Hockessin, Wilmington and all other Delaware areas. We specialize in providing homeowners with home loan options, helping you to plan for and purchase your dream home. We can also help existing Delaware homeowners refinance their current mortgages. My name is Mark Coffman. I want to thank you for taking the time to visit my website, where I guarantee you'll find plenty of helpful information to assist you in purchasing your new home or refinancing your current mortgage. I am a Mortgage Consultant serving, Pike Creek, Hockessin, Newark, Wilmington and all other Delaware areas. Although sharing these secrets may not make me popular with the other Delaware mortgage lenders, I am more concerned that you have all the information you need to make an informed decision when shopping for a mortgage. So, I have created a free guide that contains extremely valuable information designed to help you avoid costly mistakes when navigating the mortgage loan process. Buying a Home should be Stress-Free! We will guide you through the process and help you select the best possible loan option for your specific situation. Whether you want to lower your payment, build equity quicker or tap into your home's existing equity? Getting started is quick and easy. Understanding the Loan Process is Important. We explain it in a straight-forward way and we are with you during every step. Getting pre-approved is the first step towards getting a mortgage. Find out how much you can borrow. If you're planning to buy your next home, your first home, that dream home, a condo, vacation home, investment property or looking to refinance in Delaware or the surrounding areas, you will find that this site is a complete resource full of insider secrets that will allow you to choose the loan program best suited to your financial needs. I make it fast and easy for all kinds of people-including first-time homebuyers, small business owners, and homebuyers with perfect or less-than-perfect credit to get the loan you need for the home you want. Make sure you register to receive my Free Homebuying Guide and Insider Mortgage Reports, browse my Resources section, fill-out a FREE No-Obligation Secure Online Loan Application, or call me in my Newark, Delaware office at 302-494-6631. I am here to help you with all your mortgage needs. No cash to put down? Less than stellar credit? Just not sure what you can afford? No matter what has held you back in the past, Pike Creek Mortgage Services, Inc can help you find your best fit. Got a Quick Question You Want Answered Today? Click the "Ask A Question" button below to send us a message by email or feel free to call my Newark, Delaware office at 302-494-6631. Before you leave, make sure you review the Delaware Home Buying Resources, Insider Reports and Mortgage Calculators. All are designed to help guide you through the home buying process so you avoid making costly mistakes.